Even though Rosalie Sayyah’s chief passion is for a relatively common product—costume jewelry—what she does with these baubles and bangles is rare. She and shop manager/goldsmith Lucia Sayyah repair them, from rhinestone necklaces and earrings to bracelets and brooches. In this interview, Rhinestone Rosie, as she is known to customers of her Seattle store and fans who have seen her on “Antiques Roadshow,” describes the origins of rhinestones and explains what makes a piece of costume jewelry collectible. For more information, visit www.rhinestonerosie.com. 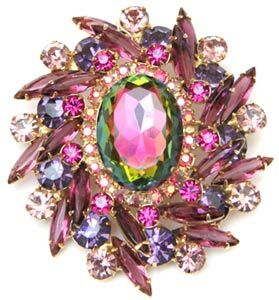 A green watermelon stone anchors the heart of this circa-1960 Juliana brooch, which also features fuchsia rhinestones and aurora borealis highlights. My parents had a second-hand store in Orlando, Florida. They sold furniture and clothing. They would buy estates, and there was always a little bit of costume jewelry included in the sale. My mom always gave it to me, and I just played with it. Years later, when I was working at a television station, I became friends with a co-worker who had a vintage-clothing store. I was doing some part-time clothing-repair work for her, but she also had a lot of broken jewelry. So I basically taught myself how to repair her jewelry. Eventually I started repairing jewelry for other dealers, and I finally opened my store in 1984. I sell mostly costume and vintage jewelry. We have thousands of pieces for sale, including some with semi-precious stones. But the thing that keeps us in business is the fact that we specialize in costume-jewelry repair, although recently we added gold and silver repair. Not very many people will attempt it because costume pieces are made out of non-precious metals. Repairing a piece involves soldering, glue, finding replacement stones, and learning the history of pieces to make them look like they haven’t been repaired. It’s actually quite hard to do. Most regular jewelers consider it beneath them to work with costume jewelry. So I discovered a niche, and it’s worked out very well for us. Collectors Weekly: What are some of the most common costume-jewelry repairs? Sayyah: The most requested repair would be replacing stones. A rhinestone can be any size, shape, or color. Most people think they’re just the color of diamonds, but they can be red, blue, or green, too. They can also be square, round, or oval. The second most-common repair is changing clip earrings to pierced. We do a lot of that, but we make sure our customers understand that an alteration like that can reduce the value of a piece by as much as 50 percent. We also do bead restringing, we change clasps, and we put clasps on bracelets, necklaces, and pins. We do what we call creative restyling. Last year a lot of the brides were wearing strapless gowns, so we had many brides coming in looking for large necklaces and hair ornaments. Most of the hair ornaments they had been looking at weren’t large enough, so we transformed a lot of brooches into hair clips, barrettes, or combs. We also lengthen necklaces if people need them longer, or we can shorten them. We can do the same thing to bracelets, or we can make a necklace out of bracelet. A crystal necklace can be restrung to create four or five necklaces by varying the style of the necklace—it has to do with the way you put the beads on the chain or string. So we do a lot of things. Collectors Weekly: Do you collect jewelry as well? 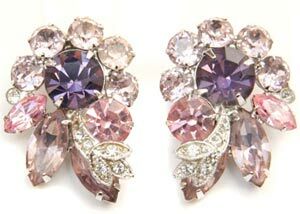 These Eisenberg Ice earrings from around 1950 include lilac, pink, and clear rhinestones, some of which are pavé-set. Sayyah: Myself? Yes, I have a nice collection. Usually if it comes in the shop and I like it, I take it home. And it also helps me because I appear as an appraiser on “Antiques Roadshow,” and I like to wear my jewelry. I want people to understand that they can wear brightly colored costume jewelry at any time of the day. It’s not so precious that it needs to be locked up in a safety deposit box. It should be worn. I try to collect the best examples if I can from eras like Art Deco and Art Nouveau. I also look for signed pieces, because some pieces of costume jewelry have signatures on them. Designers started signing pieces in about the late 1930s. Eisenbergwas one of the first. It’s not very common, and just because a piece has a name on it doesn’t mean it’s going to be valuable, because there are plenty of examples of dime-store jewelry that’s signed, too. But it’s nice to know that there is a name to look for, and some names are better than others. Collectors Weekly: What are some of your favorite pieces in your collection? Sayyah: There’s a company called Regency, or Regency Jewels, and they used fabulous colored stones in slightly darkened settings. I love the Regency jewelry. I also like jewelry that we used to call Juliana. Now we call it D&E Jewelry, for DeLizza and Elster. They did big, bold, colorful pieces. Another one of my favorites is a necklace made of rock crystal balls. It’s called “Pools of Light,” and it is a fabulous necklace. I like to mix colors, like maybe wearing a green pin on a brown jacket. I don’t do the monochromatic thing. I like to mix my colors because part of my job is educating our customers on costume jewelry. That includes its value, how to have fun with it, and even how to wear it. For example, in the 1920s they had dress clips and fur clips that nobody makes anymore. People come in to my store and say, “What is this? A shoe clip?” And I say, “No, no, it’s a dress clip.” It’s all about education. Sayyah: No. I appraise all kinds of jewelry. I usually leave the real big diamonds and high-end stuff to other appraisers. But if I feel confident that I know a higher-end piece because I’ve seen it—in 25 years you see a lot of jewelry, so your knowledge base expands—I will go ahead and pitch it to be taped for the show. 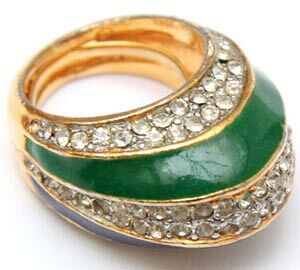 Kenneth Jay Lane enamel-and-rhinestone rings like this one were produced from the 1960s to ’70s. I’ve seen some terrific pieces. 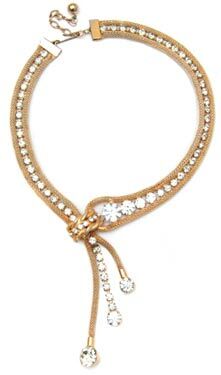 Last summer, a lady had a necklace by a designer named Henry Schreiner. She said Marilyn Monroe had worn it in a movie, but she didn’t have a picture, so ultimately we didn’t tape it. It was actually two necklaces. One was a dark-colored choker about 3 or 4 inches wide, with pearls and colored balls. The second necklace went underneath that necklace and hung all the way down to the waist. It had some condition issues, but it was fabulous. The other thing I saw last summer was some Eisenberg clothing, which was a line that preceded Eisenberg jewelry. The person brought in several pieces of clothing, as well as a purse and some jewelry. I had only seen maybe one or two pieces of Eisenberg clothing before, but here were a couple of dresses and a purse. It was really, really exciting. Collectors Weekly: Were there other jewelers who also made clothing and accessories? Sayyah: Sure. Coco Chanel, Elsa Schiaparelli, and Hattie Carnegie come to mind. That’s where the term costume jewelry comes from—the designers were making a costume, really, so costume jewelry was made to go with it. It was not a derogatory term; it was just a simple and explanatory way to talk about this type of jewelry. Collectors Weekly: When did rhinestone jewelry become collectible? Sayyah: There have been collectors all along, but I would say that serious interest probably started in the 1970s. That’s when companies slowed down their production of new jewelry while, at the same time, people starting realizing the beauty of the vintage stuff, and that so much of it had been hand worked. I opened my shop in ’84, and I was in the middle of the rush. Prior to the ’70s, people might have collected Native American jewelry, the sterling turquoise pieces from the Southwestern United States, or antique jewelry, which meant Art Nouveau, Art Deco, and other kinds of fine jewelry. But the public didn’t take notice of costume until the ’70s. Collectors Weekly: Since you opened your shop, have you noticed any trends within costume or rhinestone jewelry? Italian fashion designer Elsa Schiaparelli also produced costume jewelry, such as this gold mesh and rhinestone necklace from about 1950. Sayyah: It’s a pendulum, it’s a fad thing. One year it’s pendants, last Christmas it was brooches. Madeleine Albright’s book had just come out, so we sold a lot of brooches. People would buy her book and some brooches, too. Color trends are also interesting. For example, orange was really hot last year. And while we’ve always had a steady demand for your basic rhinestone necklace, the clear kind, lately people have been asking for bigger, chunkier pieces. Things go in and out of fashion. I’m not sure how it starts, or where. Maybe somebody sees it on television, or some designer decides to put a certain type of piece on an actress who does a movie, and then everybody wants it. Materials are also affected by trends. Plastics were big when they first were introduced. During the Depression, designers made jewelry out of nuts and wood because it was related to the economy. Today everybody is big into recycling, so trends can be cyclical. That’s at least part of the reason why I think my business is doing so well—people don’t really want to throw away that brooch if it can be repaired. Why buy a new one when the quality of the old one is so good? We try to be very honest with our customers. If we feel it’s just not worth repairing, we tell them. Sometimes they go ahead with it anyway because it was grandma’s, or something like that. There’s a lot of sentimental value in this jewelry. Collectors Weekly: When were rhinestones first used in jewelry? Sayyah: The first glass stones were called paste, and they were actually high-lead-content crystals. This was in the early 18th century, believe it or not, and the inventor was a jeweler named Strass. Then came the Industrial Revolution, which allowed manufacturers to mass produce pieces so that common people could afford to own a little pin or a bracelet. In other words, jewelry didn’t need to be made by a skilled crafts person in a little one-person shop anymore. Technological developments of that time included gold plating. And then Daniel Swarovski patented his foil-backed stones, I believe in the 1890s. Cut glass stones were not new, but Swarovski’s system produced very high quality, very beautiful crystals. I would say rhinestones really took off in the 1920s, when Coco Chanel started showing them with her clothing. Suddenly everybody realized that they could wear these, that it was fun. During World War II and especially in the 1950s, rhinestones took off way, way big. Many women were working outside of the home for the first time. They wanted to buy themselves something special. Jewelers took note and began making a lot of this costume jewelry. Millions and millions of pieces were produced. People liked it because you could wear a piece of costume jewelry and if it got lost it was not that big of a deal. Collectors Weekly: Which eras are the most sought after? 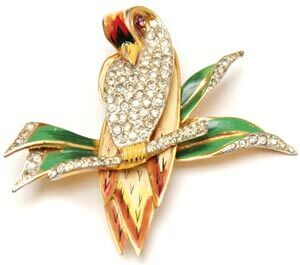 This CoroCraft brooch, circa 1940, uses pavé-set rhinestones to contrast with the feathers and leaves that have been painted on the pin’s sterling base. Sayyah: Right now, hands down, Art Deco. True Art Deco jewelry is extremely desirable. Prior to that it would be the Victorian pieces and the Art Nouveau pieces, but then you’re still getting into more fine, high-end pieces, although there are a lot of nice silver pieces. (I consider sterling silver to be in the costume-jewelry realm.) But definitely I would say Art Deco, from about 1915 through the 1930s. There are definite style points to this jewelry—we don’t see a lot of it in the store. Art Deco was one of the first styles that people collected, so the better pieces are already in good collections. There was a lot of production of lower-end pieces, but the really fine, very high quality pieces, with good silver and synthetic stones, are hard to find. The types of pieces aren’t all that different from what came immediately before or after. There were earrings, brooches, dress clips, necklaces, shoe clips, and rings. It was all the same types of elements, but they were just superbly designed. Art Deco costume jewelry was sleek, clean, graphic, geometric, and wonderfully made. Collectors Weekly: What kinds of non-precious materials did jewelers use before rhinestones? Sayyah: The Egyptians used glass, along with brass that looked like gold. Pinchback was another substitute for gold. There were natural materials like jet, gutta-percha, and bog oak that were used in the Victorian Era. These were non-precious materials that today would be considered costume jewelry, but the term didn’t really exist back then. In the theater, they called rhinestones used in costumes paste. In fact, at the turn of the 20th century, there was a good deal of jewelry created expressly for theatrical costumes. They were all glass, and the pieces weren’t intended for wearing in public because they were just too big. Collectors Weekly: Can you tell us some more about Daniel Swarovski? 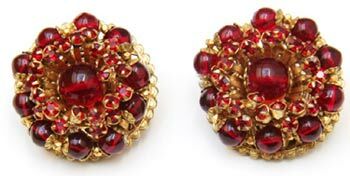 Red beads and rhinestones set in gold filigree make these Miriam Haskell button earrings from the 1950s particularly eye-catching. Sayyah: Sure. He was an amazing influence because he was the one who developed a permanent foil backing for stones. They were the best quality, were made of brilliant high-lead-content crystal, and came in various colors and shapes to imitate turquoise, carnelian, onyx, sapphires, and rubies—every possible gemstone you can think of. Even today, Swarovski still makes the best rhinestones. Until he came along, people didn’t realize that glass could look like this. Most of the costume jewelry in America was made in Providence, Rhode Island, Newark, New Jersey, and the New York City area. These jewelers would buy their stones from Swarovski and other suppliers in Europe. They would make the settings here in America and put the imported stones in the settings. Ironically, a lot of the major costume jewelry that was produced in America was exported to Europe, so the stones made a round trip. That’s one of the things our shop can’t do, by the way—re-foil a stone. When they tarnish you can’t clean them. So you have to replace the stone if you want the piece to look its best. Collectors Weekly: Is most rhinestone manufacturing still based in Europe? Sayyah: I’m pretty sure it is. Swarovski is located in Austria. The Gablonz region of Germany and what used to be known as Czechoslovakia are also centers. So it started in Eastern Europe, and that’s where the best stones still come from today, as far as I’m concerned. When you put diamonds next to some of the older rhinestones, it’s hard to tell the difference. They’re beautifully done. Collectors Weekly: Did European jewelers also use rhinestones? Sayyah: Yes, and in the former Czechoslovakia, they also made their own settings. The thing about the American jewelers, though, is that they took it to the limit, they realized the rhinestone’s potential. Most of the pieces that were coming out of Europe in the teens, ’20s, and ’30s were more modest than what the Americans ultimately ended up producing in the ’50s and ’60s. We made really huge pieces. The French were also known for their fabulous jewelry, and their rhinestone jewelry was exotic and wonderful. But the best stuff was produced in America. Collectors Weekly: Who were some of the best rhinestone jewelers? This Eisenberg clear crystal dress clip from 1940 boasts baguette, round, and cushion-cut stones set in a pot-metal back. Sayyah: Well, the early ones would be Eisenberg, for sure, along with Trifari and very early Hobe pieces. I’m going say the teens and ’20s were when people really started producing it, and those were the names most in vogue. A lot of the second-wave costume jewelry designers started out as fine jewelers. Some came to America prior to World War II—they were here for freedom. For example, Marcel Boucher had worked for Cartier making fine jewelry. Other important names in costume jewelry, though not all were immigrants, included Hattie Carnegie, Chanel, DeRosa, DeMario, Miriam Haskell, Florenza, Har, Hollycraft, and Mazer Brothers. I’ve already mentioned Hobe. Joseff of Hollywood made jewelry for the movies in the ’40s. He devised a special setting that allowed his jewels to reflect the studio’s bright lights. Renoir-Matisse did beautiful copper and enameled pieces. McClelland Barclay, Napier, Panetta, Schiaparelli, Schreiner, Warner, and Weiss are a few others. A Canadian company called Sherman produced beautiful pieces. So there were a lot of them. Not all of them signed their pieces and not all of their pieces are especially collectible. Collectors Weekly: If a piece isn’t signed, how do you determine who made it? Sayyah: You can tell by the type of settings that they used, the clip. If it’s an earring, clues include the type of clip on the back, the color of the stones, the shape of the stones, the way the metals are finished. Ultimately it’s a guess if it’s not signed, but it’s an educated guess. Collectors Weekly: Out of all those designers, what are some of the must-haves for collectors? Sayyah: Well, right now the hot one is Henry Schreiner. Really bold Miriam Haskells from the 1950s are always in demand. Har did suites of dragons, cobras, and genies that people love to collect. And original gold-washed, or vermeil, sterling Eisenberg pieces, especially the faces or animals, are very high-end collectibles. DeRosa is hard to find so it must be in demand. The market tends to be fickle, though. One year it’ll be something by Hollycraft and the next year it might be Regency. So it changes. A very popular style of jewelry that’s highly collectible today is the Jelly Belly, which usually consisted of an animal made out vermeil sterling, with a carved piece of Lucite for its belly. Legend has it that the Lucite for these pieces came from recycled airplane windshields. I’ve seen Jelly Bellies sell into the thousands for a single pin. 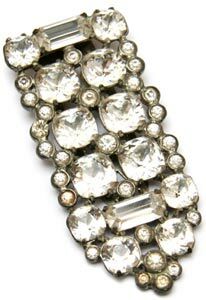 Collectors Weekly: Were there eras when bigger rhinestones were more popular than smaller ones? Sayyah: The 1950s were all about really, really big stones in bold colors. In the ’20s, during that Art Deco period I was talking about earlier, they did more of what they call pavé setting, which is when lots of tiny stones are set closely together. That’s a good indicator of Art Deco, whereas in the ’50s it’s mostly bold, brilliant, and big, big, big. Collectors Weekly: What accounted for this change? 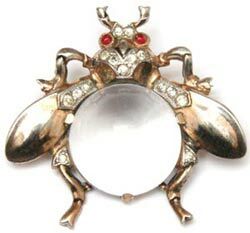 Many Trifari Jelly Bellies from the 1950s were relatively simple, such as this fly brooch made of sterling vermeil, diamante accents, and red cabochon eyes. Sayyah: Well, basically, we won the war, and we were glad that we were able to get stones again from Austria because we couldn’t get them during the war. So designers and customers alike just went nuts. Christian Dior came out with what he called the new look or the big look, and he showed his models wearing big necklaces and bracelets. Everybody wanted it. Big cocktail rings were extremely popular. It was just Americans feeling good about themselves, I think—costume jewelry reflected that. We weren’t even trying to make it look like real jewelry. It was obviously fake, but that’s what people loved about it. One important technological development from the ’50s was the introduction of the aurora borealis coating. It was a chemical salt that was applied to the surface of glass stones and beads. You don’t see that until the ’50s and ’60s, and that made the jewelry even more sparkly. When you see that coating, you can immediately date the piece. Collectors Weekly: So these pieces were mainly for cocktail parties and special occasions? Sayyah: You bet. Movie stars were wearing them on screen, so people followed suit. Remember, in those days a lot of women wore hats and gloves when they went out. All their outfits were coordinated, so they had to have jewelry to go with certain outfits, whether it was for a cocktail party or an afternoon tea. Today people are very open-minded about how they wear their jewelry. And I think collectors’ tastes change as they mature. They eventually want the better-quality pieces. In the beginning they just buy anything that glitters. At some point, though, there is a tendency to refine, which is not to say that they are inclined to limit their focus. At least I know I’m not. I like lots of different things, and what I decide to wear and how I want to wear it really depends on my mood. Collectors Weekly: How did these impulses differ from the trends in jewelry before the 1950s? Sayyah: In the Edwardian period, which was the very early 1900s, jewelry was lacy—small pieces with lots of delicate filigree work. As women went from being the Gibson Girl, who was covered in clothing from head to toe, to the flapper, whose arms and neck were now exposed, there was simply more room for jewelry. In the 1920s and ’30s we also had Art Deco. We were going through the Depression. People were making jewelry out of nuts, beads, and lots of plastics—from celluloid to Bakelite. In the ’40s, during the war years, metals were restricted, so a lot of the jewelry from the ’40s is dominated by one big stone. Even fine jewelry from that period looked like this, with rose gold as a popular base. In the 1950s everything opened up, with lots of colors and bright metal settings. The open look of ’50s fashions encouraged jewelry to get bigger. So what the jewelry looked like was definitely a function of the culture and the economy of that time. Collectors Weekly: What were some of the regional differences in terms of how people wore jewelry? 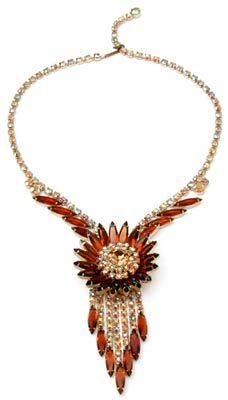 For this bold, sunburst necklace, Juliana designers placed Colorado topaz navette rhinestones around a core of aurora borealis gems, which dates the piece to about 1960. Sayyah: For instance, women in California probably wore more white jewelry than women in Michigan. People who lived in the Southwest, in Santa Fe or Arizona, wore more silver and turquoise. Back in New York, where there was lots of immediate access to fashions from Paris and London, women wore more of the high-end stuff. As for the big costume jewelry producers, they made everything, but not every store in every region of the country sold their entire lines. In some cases it was because people in a certain part of the country didn’t dress in a way that would allow them to wear certain kinds of jewelry. A regional buyer for a department store might think, “Well, this won’t go with my market,” so they just didn’t buy everything the designers produced. Or maybe the colors weren’t right for their complexion. Up here in Seattle, we don’t get a lot of sun. We’re not real tan. As a result, it’s hard for me to sell big silver jewelry. We prefer colored pieces. It’s an interesting phenomenon. As you travel around, from Florida to California, you notice definite regional differences. Collectors Weekly: What makes a piece of rhinestone jewelry rare? Sayyah: First of all, it’s probably going to be one that was not mass-produced. Most companies did a lot of mass production, but there were some items that they didn’t make thousands and thousands of pieces of. That would be one criterion. The next one would be its quality. It’s probably a piece from a designer who worked in fine jewelry before going to costume. Quality means its presence, something you can not only see but also feel. It could be a multidimensional piece made from several smaller pieces that were cast and then screwed together. When you look at a lot of costume jewelry, it’s hard not to notice that a lot of it was very inexpensively made. And then you find that one piece that just says quality to you, and that stops you in your tracks. Rarity is also key, but it’s not precisely the same thing as whether or not the piece was mass-produced. For example, it might have been a weird piece for the time that just didn’t take off with the general public, so maybe the company cut back production or pulled it off shelves. Collectors Weekly: What are some of the rarest pieces you’ve come across? Christian Dior is one of many mainstream fashion designers who created costume jewelry for their customers. These earrings from around 1970 feature diamante and faux emerald rhinestones. Sayyah: There was a German company called Theodore Farner that made some beautiful sterling jewelry in the 1920s and earlier. I find them to be quite unusual. In my own collection I have an Eisenberg original sterling fish with topaz rhinestones. That one is very desirable. I have an unsigned piece that’s a parrot on a circle of glass. It’s just fabulous. I’ve had some very early sterling pieces by Georg Jensen, as well as some very good pieces by Miriam Haskell that have sold in the $3,000 range for a necklace, brooch, and pair of earrings. And I’ve seen some pretty amazing Bakelite pieces, some of the bracelets and little carved figures. Those are pretty phenomenal, and rare. Collectors Weekly: What advice do you have for people who are fairly new to collecting rhinestone jewelry? Sayyah: Buy what you like, buy the best that you can afford, and be willing to pay a little bit more for something if you really like it because it’ll probably pay off in the end. I don’t tell people to buy it as investment. I just say if you like it, buy it. And wear it! Don’t be afraid to wear it. I could probably give you a long list of books, but off the top of my head, I like Judith Miller’s book on costume jewelry, Carole Tanenbaum’s Fabulous Fakes, and Christie Romero’s title for Warman’s. I really enjoyed reading your page on custome jewelry it is very informative. I also collect and sell custome jewelry and have several great pieces that need some repair or stones replaced. I live in S.W.Fla.Do you except pieces for repair from out of your area? Yes we accept pieces from all over the world. Just go to my website, find the form under Services and send in your items… Looking forward to working with you and thanks for your kind comments. Wow! Really nice article Rosie. Would love to have seen some of the pieces you specifically mentioned in the article, but did like the pictures that were there. You and Lucia do great work. Looking forward to seeing you on “Antiques Roadshow”. When is the next airing? how can you tell without appraising a costume jewelry ring from the real thing? Are adjustables always costume, is there a different sort of setting used for fakes. it for her. She has a signature piece that says MI Vest Germany on it. to know what kind of material this would be and who is MI Vest? Found your article (and loved it) when searching for info on Chanel goldtone button earrings with small rhinestone CCs. Not marked, probably from the 60s, clip. My Dad, who would now have been close to 100, owned & operated 2 successful tool & dye plants in Providence and held patents on several ear clips, so I suspect these may have been given to him (as they frequently were) to provide a better clip. Thanks for contacting me at BellaOnline Jewelry Collecting~ This is wonderfully written article that I will pass on to my readers! I have a Eisenberg brooch that belonged to my great grandmother. From my research online, it looks like it is from the late 1940’s. I have not seen one like it online, and would like to know what it is worth. It has Eisenberg engraved on it and sterling and also the number 3 engraved on the back. The stones are emerald green, aqua blue, red, purple, and pink, and clear rhinestones. It almost takes up the whole palm of my hand in size. What is the best way to determine how much it would be worth? Thank you Rosie for an informative article. I love to catch you on Antique Roadshow and learn something from you or Lucia every time I visit your shop. So glad that you are here in Seattle! Sorry I don’t know in advance when the Antiques Roadshow will be airing an episode on which I appeared… Just keep watching the show! To Susan Siebler: Fakes or costume rings are set in base metal or sterling… And, yes if it is Adjustable… it’s costume. To Judy Batishko: I cannot help you with these pieces… but if only the stones are old the piece is NOT vintage. To Myrna Farr: Yes, I can fix your clasp… And, I think the name on the older jewelry is WEST GERMANY…. To Kelly: If you can send me a pix of your Eisenberg brooch, I may be able to help you. Go to my website for more info. Dear Rosalie – I am a private collector and would like to sell my pieces – some gorgeous stuff! Lots of D&E, etc. and some very unusual & rare things. Would you suggest selling individually or as a lot? Where would be a good place to start (not EBay, I think!). Thanks so much, in advance. In regards to your collection…I do think that Ebay is a very good vehicle…It gives you a world wide audience and you can always put a reserve on those special pieces…If you do not want to tackle this yourself, we do offer consignment options..Please let me know if you are interested.. I love your website – it is quite informative. I collect rhinestone costume jewelry and my primary color choice is green. I also make jewelry – uranium vaseline jewelry and collect depression glass (primarily green and yellow). Uranium vaseline beads and glass fluoresces under blacklight conditions. I found when working with my jewelry that the majority of my green rhinestones also flouresed. I have both signed and unmaked vintage jewelry. Anyway, my question is this. Are there any references about coloration of rhinestones with uranium content? When and where did it start? I have purchased costume jewelry books, Warman’s Jewelry 2nd edition with hope in getting this answer and my vaseline collector friends have no answers (because it it green and considered uranium glass – still very pretty to me). I am fascinated with the older eras. I inherited my mom’s “costume” jewelry and am trying to reseach it. I have a pink butterfly pin and earings with WEISS on them. I wear a lot of the jewelry because I enjoy it. I have a red rhinestone necklace, earings, and bracelet(the bracelet has to be repaired) I also have numerous “white” pieces and several other pieces-emerald, royal blue, and purple. Your site has given me some leads for my research. Great site. Thanks. Great interview, very informative. Have you ever seen any costume jewelry with the mark: SCHWARTZ ? I have a brooch and not sure if it’s costume or real. It has a rather large cabochon stone that I cannot identify, either, and the design of the brooch has a sort of art deco feel to it. I’ve tried researching online and found nothing on any jewelry designers named Schwartz. I’m interested as to when rhinestones were made into buttons and what there uses were. I’m assuming it was for clothing. Were there specific manufacturers, designers who wanted them, etc. Did all people wear clothes with them or did they appeal to certain “classes”? How would I find out more about when the first rhinestone button came to be (year) and how they evolved? Lots of good information. Can rhinestones be worn anytime with anything? I have even seen it with jeans, but would like to know what is “correct”. To church, work, shopping, etc.? Thank you. I have some costume earrings that are my favorite, not vintage but about 30 yrs old. The rhinestone fell out and I glued it back. The problem is that it doesn’t shine like before and I noticed that it was painted on the back kinda like a mirror but looked gold…..what is it painted with so I can remove it, re-paint and glue it back. If not can I send it to you to be repaired. Pretty sure I could do it myself if I knew what to paint it with. Thanks for you help….I appreciate it! Hi, I have been collecting costume jewelry for years and have a beautiful Regency necklace recently I found the matching bracelet but it is not signed and ?? and has 2 rhinestones not in the necklace but appear original to the bracelet there also appears to be 4 different styled maybe molded stone in it. I have recently found a marked regency bracelet very simular which also have 4 unusual stones in it but is marked regency. However the unmarked piece has the settings that are more identical to my Regency necklace! did regency ever not sign their pieces ? Thank you ! To pat king. Yes we can convert almost anything into pins. Thanks for the question. Hi, I am looking for help in finding out if I can get a Trifari rhinestone necklace with (from what I’ve read so far) possibly Cabochaon and baguette stones replaced anywhere? I have a necklace and matching bracelet that was my mother’s and is sentimental for me and my daughter who would love to wear it. I went to my local jeweler yesterday and finally asked about it. It was then that I found out it’s a metal ( I think) and would melt. I’m hoping that there’s is someone that knows how to repair these pieces that my jeweler is unaware of. I live in CT and if you know of anywhere near here (even NYC) that I could go to I would appreciate it. I’m so afraid to mail it to anyone that in case it got lost. At this point it means so much to my daughter to have these pieces to wear that belonged to her grandmother that she’ll wear it as is! I’d like them to be fixed. They (or at least the bracelet) is marked with the crown. I don’t know if that helps in you telling me anything. Thanks for your help! We do this type of repair, but you will have to mail the pieces to us. You can go to our site, rhinestonerosie.com and print out the repair form for the order. Unfortunately I do not know of anyone in your area who can help. I have a Kramer NY rhinestone necklace and bracelet with missing stones. How much does it cost to replace up to 10 rhinestones. Seven on the bracelet and one or two on the necklace. A rough estimate would be suitable to me. I would have to mail them to you for replacement. Is Kramer NY worth repairing? Thank you. Love the site. I’m still unclear on the difference between “paste” and “rhinestone”–the former is high-lead flint glass and the latter are Swaroski’s proprietary, foil-backed stones? What causes paste stones to darken? Will regular cleaning slow or stop this process? Do rhinestones and paste undergo similar darkening and for the same reasons? “ ” People who walk, bike, or take transit are bankrolling those who drive.